Let's Get Out Of Here! : Super Buddha Man! It's all superheroes all the time in this outing with Mr. B. Man! He's also supported by a fine cast of replacements for the cast from the 2003 movie and some fine new co-stars like Tim Blake Nelson (The Good Girl) and Ty Burrell (TV's Modern Family). So, with a very solid script on the table the story picks up with Bruce Banner hiding out in South America, quietly working off the grid and very surreptitiously teaming with an online pal named Mr. Blue to find a cure for his predicament. Eventually, events will occur that bring Bruce back to America - where he spends time with Betty Ross (Liv Tyler - Empire Records) while dodging her father General Thaddeus "Thunderbolt" Ross (William Hurt - Altered States) and the United States military under Ross's command, including aging tough guy soldier Emil Blonsky (Tim Roth - Pulp Fiction). Thanks to several bad decisions by several characters, there will soon be a new gamma irradiated beastie walking the Earth - the Abomination - and the brawl for it all is on! the name David Banner gets rolled out with a wink; Joseph Harnell's haunting TV theme music is heard; the gamma machines seen in the opening look very much like the ones from the series; Fort Johnson is named for series producer Kenneth Johnson; a clip from The Courtship of Eddie's Father featuring Bill Bixby is seen on a television; and Lou Ferrigno turns up as another security guard, but gets more screen time and a little comedy this time out, AND he gets to perform the voice of the Hulk! They even manage a nod to the 60's Hulk cartoon by casting Bruce Banner's voice - Paul Soles - as an old pizza guy Bruce knows from way back. Let's keep listing the positives: there are scads of references to the comics throughout, including names like Richard (Rick) Jones and Jim Wilson; this film takes place during the same time period as Iron Man 2 - events from this movie play as a live news report in the background of a Tony Stark/Nick Fury scene in IM2; and Hulk co-creator Stan Lee turns in a really sweet cameo that actually has The Man playing a part in the story! 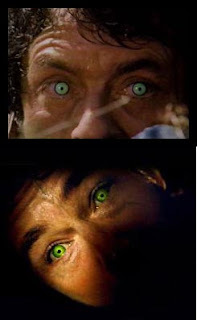 Of course, there are some negatives too, but mainly just the one: the Hulk is still CGI here - and although he looks better than he did five years previously, I'm still not sure pure computer effects was the way to go. 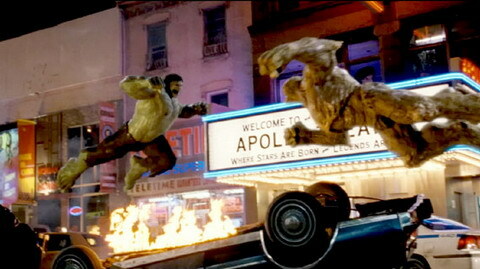 Since both the Hulk and the Abomination are achieved with this method, the final twenty minutes of the movie does once again resemble a cut scene from a Hulk video game, but the battle is well handled for all that, with scads of property destruction and big comic book style bashing throughout. Summing it all up - if you're into the Marvel comics movie series that started with Iron Man and continued through IM2, Thor, Captain America: The First Avenger and culminating in the The Avengers - you'll probably want to check this one out, as it is another piece in that filmic mosaic, if a little disconnected from them due to the main character's isolation. It also includes a cameo from the other movies, although maybe not the one you expect. In any case, watch through the end credits for sure. In the end, anyone who likes a little superhero action mixed with a lot of destructive rampaging should definitely check this one out! Anyhoo, wait until you see Superargo's car, which looks like a rolling Ginsu commercial when you push the right buttons! Funny stuff! And well worth a watch for those who like a heavy dollop of ludicrous in their filmic coffee cup! That will retire our movie watching capes for this time. And please always remember - if Superargo's tights weren't bulletproof, he'd be dead now. The Incredible Hulk was really good to me and Superago looks hilariously bad Craig. 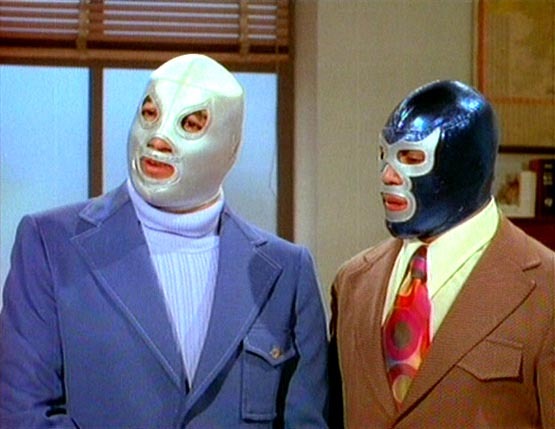 You pegged both of them - there are apparently scads of Superargo movies out there - but I've only seen the one. I need someone to do a nice 10 or 20 movie boxset of them for a bargain price. And while I'm wishing - good prints, and anamorphic widescreen please. I loved this Incredible HUlk and could not stand the first one. Why? Because Ang Lee tried to give serious drama and angst to a Marvel hero minus the campy fun. Bruce Banner is NOT Jane Austen. Then there's Jennifer Connolley, who routinely puts me to sleep. The woman is BORING like Eva Green as the uber-dull Vesper in Casino Royale. These two actresses should team up for an Ambien ad. I will most definitely have to check Superargo. It looks a like cheesy delicious good time. I would adore seeing a big Superargo post over at TheMovie411! cgi backgrounds I need someone to do a nice 10 or 20 movie boxset of them for a bargain price. And while I'm wishing - good prints, and anamorphic widescreen.